Wisconsin&apos;s Tribal leaders say Native Americans are facing a time of challenge and promise. 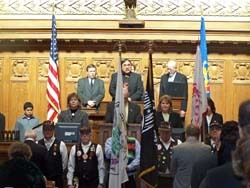 Members of the Great Lakes Inter-Tribal Council came to the Capitol Tuesday for the annual State of the Tribes Address. Council President Robert Chicks urged better communication between lawmakers and the tribes, because they must work together to overcome similar problems. Chicks says they are working to address rising health care costs and parity in tribal schools. He also called on lawmakers to include the tribes in efforts to approve the Great Lakes Compact, saying they are a valuable resource to them as well. Chicks also called on lawmakers to approve a resolution recognizing the sovereign tribes of Wisconsin. He says it is difficult to create a stronger relationship, until those principles are articulated in legislation. Chicks says lawmakers must move beyond ceremonial recognition of the tribes.